New Campaign AI and BAI settings for NTW3 v8.1 Single Player Campaign. Campaign AI -Better Ai faction Region development,Technology research,Expansion,Regional defense, construction behaviors-more aggressive WAR settings, better diplomacy-allies will help more, unit balances. Bigger armies and navies. Larger naval ship movement ranges. Battle AI new formations, longer range for muskets and artillery- but less accurate,better flanking behavior, less blobbing, more fire fights, new morale settings for longer battles, new fatigue settings, new spotting settings, new mass settings for men and cavalry-horses may pass through units-had to change as it caused major problems for the AI,. I did what I could with lousy CA AI code and path finding. It think it works ok for what it is. Battles will be very bloody affairs so you are going to have to change your tactics. House Rules: Best to let AI build up some forces for 10 turns before attacking, Use ultra size settings and set unit multiplier to 1.3 to 1.6 in your preferences file. NEW:BATTLE TERRIAN MOD by Sirloin and Live2Sculpt: Enlarges battlefields to maximum sizes and adds more varied terrian features. PLACE INTO YOUR NAPOLEON DATA FOLDER. RECOMMENDED DIFFICULTY IS HARD CAMPAIGN VERY HARD BATTLES. REMEMBER THIS IS BRAN SETTINGS SO PREPARE TO BE HIT HARD AND OFTEN. Go into your Napoleon Preferences script file located in Drive C;Users/user name/AppData/Roaming/Roaming/The Creative Assembly/Napoleon/scripts/preferences.script. Go back to the preferences file and right click on it and go to properties and click 'read only' and then apply then ok.
Last edited by Bran Mac Born; December 08, 2018 at 04:21 AM. Bran's C_AI and B_AI mod is an alternative NOT a replacement for the NTW3 mod and is meant to give players a little different campaign game to play. We recommend that you start a new campaign from the beginning as his mod has many changes that will significantly affect the campaign play and stability. Our Campaign_AI settings were designed to focus on the traditional land battles that took place during the Napoleonic wars, his will give you a new playing challenge to the campaign game. The new Battle_AI will significantly change your campaign battles from the traditional NTW3 battle stats. PLEASE read Brans notes on these changes in his post above. Last edited by Lord Davn; December 30, 2014 at 05:26 PM. 1.) Go to the Napoleon Total War "data" folder and move the original NTW3_cl_campaign_spcn_v5.pack file (Date: 11/24/2014) to an empty folder. 2.) Download Bran Mac Born's mod and extract his file into the same "data" folder. The file names are identical, the only difference is the Date modified for Bran's (12/16/2014). 3.) Start a new campaign game as we recommend above and look for the improvements that Bran noted in his post. It may take a little time. the mod is really well done. I have almost the same changes attempted because of the move on the battlefield but the cavalry was always exhausted so quickly. So gatulation made great. New Campaign AI and BAI settings for Single Player. Campaign AI -Better Ai faction Region development,Technology research,Expansion,Regional defense, construction behaviors-more aggressive WAR settings, better diplomacy-allies will help more, new army balance settings-a bit more Artillery and Cavalry. Battle AI new formations, longer range for muskets and artillery- but less accurate,better flanking behavior, less blobbing, more fire fights, new morale settings for longer battles, new mass settings for men and cavalry-horses may pass through units-had to change as it caused major problems for the AI, added one extra cannon per artillery. I did what I could with lousy CA AI code and path finding. It think it works ok for what it is. 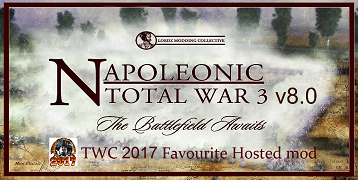 Install instructions: Go into your Napoleon Total War data folder and make a backup of the file called NTW3_cl_campaign_spcn_v5. After you make a back up, delete that file. Unpack the new Bran version of that file into your Napoleon Total War data folder. Drive C;/Program files (x86)/Steam/Steamapps/Common/Napoleon Total War/data. I liked this sub-mode, he managed the IA to form in lines and that Cavalry do not loads to the start every battle. As I noted in my post above, Bran's CAI & BAI mods are alternatives to play with the NTW3 mod and have significant differences from our BAI settings and battle stats. Any adjustments to his mod will have to be done by him. true, why I made a suggestion to him. Last edited by Bran Mac Born; October 09, 2018 at 03:22 AM. I thought you would be decreasing the speed of the units, not increasing them. if better accuracy means higher kill rates that will be a mistake as the kill rates are much to high as it is. You still have the problem of the AI trying to form its line at an angle to mine getting shredded as they go. All the accuracy of units was lowered by 40%-just raised Elites more by 5%. Speed of units was raised by 30% as was way too slow for AI response. Not seeing the angle thing you say they line up in front-if they line up at a slight angle that is because of the changed firing arcs of the line unit and the units get in a position to hit your flank. It is never going to be perfect with this game as the BAI routines were not completed by the game company- that is the sorry state. I think it plays better as AI is more aggressive. Last edited by Bran Mac Born; January 14, 2015 at 11:59 AM. Last edited by Bran Mac Born; October 09, 2018 at 03:23 AM. I was getting a crash in a campaign battle, and it went away after restoring the original cl_campaign_spcn file. I tried to attach it but it wouldn't upload, if you want it I can find another way to send it - please note I am using 80 units per army (! ), the modified UI for that, and z_modified_deployment_zones.pack, though maybe the save file will work anyhow. Are you planning on incorporating the changes in the updated cl_campaign_spcn Christmas update? In any case I'll try your updated version. btw thanks for your mod! Last edited by Bran Mac Born; October 09, 2018 at 03:25 AM. UPDATE: NEW 40 UNIT Campaign Version. AI upkeep lowered by 35%, raised unit caps by 50%. Massive Invasions. AI can now make 40 unit armies without bankrupting their economy. Most regular line infantry recruitable in 2 turns. You will face full stacks. 03/03/16 7.1 patch compatible. Included are Albtraum23 UI mod and Larger Deployment Zones mod to use for 40 unit armies. Unpack them into your Napoleon Data folder. ESF editor allows you to edit saved games and is used by modders. 6.) Set the values "20 20" to "40 30"
8.) Start the game and open the new modded save file with the 40 units. Last edited by Bran Mac Born; January 23, 2017 at 09:27 PM. 80 I think I don't do half measures when it comes to, well, just this. The campaign battles were stable - the problem seemed to occur repeatedly on bridge battles against a large army (approx. 15,000) in the Paris area, and using the original spcn file solved it - maybe there is an erronious unit stat or something? The crash wasn't happening until later in the battle (possibly on reinforcement). I did try zipping it, I think it was over the size limit - .7z seems to have halved the size again to about 7MB but I'm still getting "upload failed". Last edited by Bran Mac Born; October 09, 2018 at 03:29 AM. UPDATE: New 40 unit campaign version. See post 15 above.